China has one of the highest rates of caesarean section in the world, and China's health ministry has for years been paying lip service to the idea that this is not such a good thing and that vaginal births should be encouraged. The investigation, led by Dr Susan Hellerstein of Harvard Medical School and Brigham and Women's Hospital, found that caesarean section was being encouraged by the hospitals as a way of coping with the huge workload of birthing mothers (16 million babies are born in China every year, 200,000 in Shanghai alone). The high rates of caesarean section were also being driven by mothers wanting a quick and 'safe' birth on a lucky day, and also driven by hospitals wanting to avoid medical disputes with patients. The end result is that China's hospitals are simply not set up to allow women to have vaginal births - the obstetric hospitals do not have labour rooms and do not have the staff to allow women to give birth by labour rather than by caesarean. 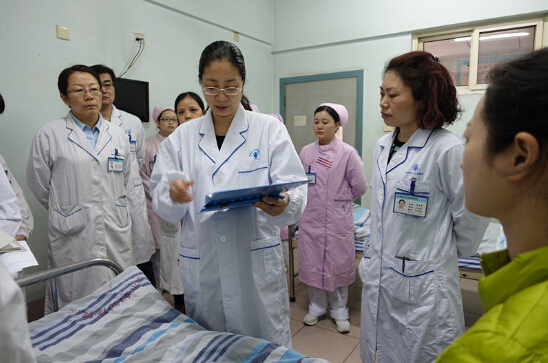 As part of their investigation the team, which included Professor Tao Duan, Director of Shanghai Woman's Healthcare Institute, visited five public hospitals and one private (VIP) hospital in Shanghai. They asked many questions both of women and of the medical staff. The second - and largest - tier is the Shanghai public hospital system for city residents. This offered a basic obstetrics package, which usually involved a scheduled caesarean and two days of recovery, for a cost of about $1000. Most of this was in theory claimable on the health insurance that is provided by employers. (Some public hospitals offered 'VIP packages' and add-ons at a cost of $5000). 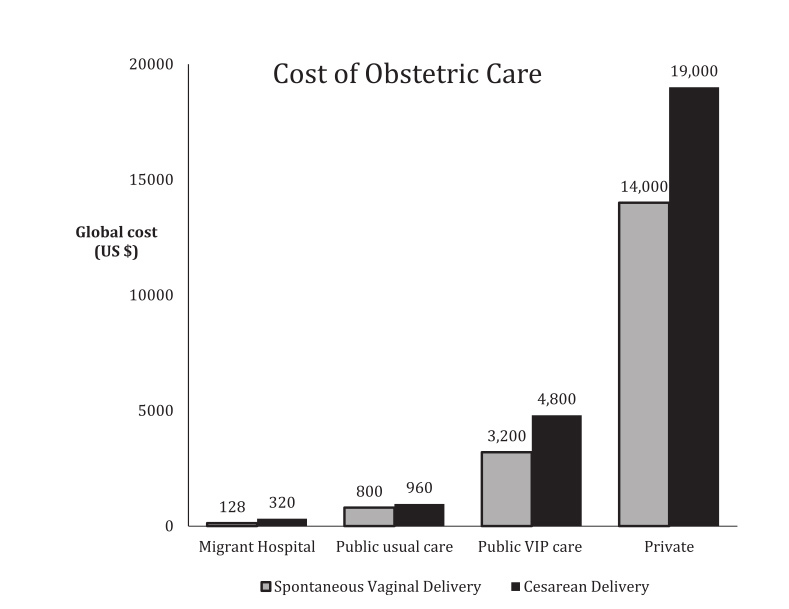 The third tier is the migrant workers' obstetric hospital network. These basic clinics offer a minimal obstetrics service for about $300. One of the most striking things the US researchers noticed about the Chinese maternity hospital system was the high number of patients and low numbers of staff. It was quite normal for a single obstetrics outpatient clinic to have 80-120 women scheduled in one eight hour day. Even the "VIP" services saw 40-60 patients a day. Although women got to have very little time to spend talking with the doctor, the researchers noticed that they tended to have more tests and investigations, which they found to be part of a 'defensive medicine' trend. The high number of patients also put pressure on women to have caesarean sections - a typical birthing unit could expect to deliver eight babies in an eight hour shift, with each caesarean section taking about 30 minutes ( in contrast to vaginal birth taking from 4-24 hours). The average caesarean section rate observed in the Shanghai hospitals was 66%. The women who did have a vaginal birth did so alone (family are not permitted to be present at the birth) and without the aid of analgesics - no epidurals! Women usually had to share a maternity ward with up to four other women and did not have any personal or emotional support from either nurses or doctors. New mothers are allowed to stay in the hospital for two days of postnatal care after a caesarean section and four days after a vaginal birth. This time was deemed important to Chinese families so that the new mothers could avoid 'hot and cold', rest and consume traditional soups, the researchers found. When the researchers interviewed mothers and doctors at the hospital they found several factors that encouraged caesarean sections. Firstly there was maternal preference - Chinese women did not want to go though the pain of vaginal birth and feared this would spoil their health and sexual function. They also preferred the convenience and speed of caesarean section, especially as it could allow them to have a baby on a lucky day. Most believed that caesarean section was safer. The doctors interviewed also said that pressure from women and their families was a major factor in encouraging caesarean sections to be the norm. Most doctors expressed strong feelings about the risk of disputes with patients and their families over medical events, with more than 60% having had experience of serious medical disputes with patients - often physical. Doctors also conceded that there were 'system' pressures on them to provide caesarean sections - it was more efficient and financially lucrative for the hospital, and doctors' salaries were based on the number of women who were managed though birth every day. "The concept of protected open medical discussion of errors or poor outcomes, transparency with patients, and patient apology were neither well developed nor deemed culturally acceptable by most chiefs of services," they noted. 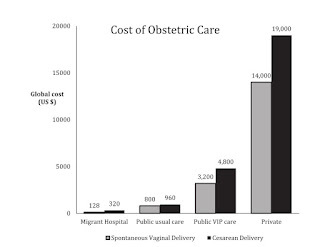 The researchers found that hospitals were geared up to provide caesarean sections as the main method of delivery - the ratio of operating suites to labour suites was 2:1, in contrast to maternity hospitals western countries where the ration is heavily in favour of labour units over operating theatres. "We observed that ... most public obstetric care did not meet rising patient expectations with ward style labor and delivery suites, lacking family involvement, pain control, and emotional support in labor. In the cosmopolitan environment in Shanghai, with advanced public transportation and ubiquitous high tech consumerism, the public health care system lagged significantly in development and appeared out of synch with other aspects of society." They concluded that the high rate of caesarean sections is likely to continue in China's hospitals due to the high throughput' of women in the maternity system and the institutional factors that promote an 'efficient' rate of births. The high caesarean rate is also reinforced by societal and institutional pressures that put the emphasis on convenience and control in contrast to the untidyness and unpredictable nature of a spontaneous vaginal birth. Medical news section is waiting for the new area of fun zone. Get the real chance of the fun and dig this in order to find the new area. You can get the independent site and enjoy the new section of the medicine with this informational zone.